There are 3 kinds of home pages, “Static,” “Full Post,” and “Excerpt.” With a Static home page you are, so to speak, making a website, that can also have blog stuff in there somewhere. With Full Post or Excerpt, you’re making a blog. So if the focus of your site is selling widgets or promoting your band, you might prefer a Static home page. But if you’re a blogger, journalist, author, etc, you probably want to launch right in with the blog already. A lot of peeps like a “Full Post” home page where all the words and pix of one “full post” run straight thru and below that is the previous one. Others prefer “Excerpts” where there aren’t any full posts on the home page, but it’s more like a magazine cover or table of contents giving you access to many choices. iRez uses an excerpt home page. There are many posts to choose from in the “Featured Slider,” in “Sub Featured” & “Latest News,” etc. 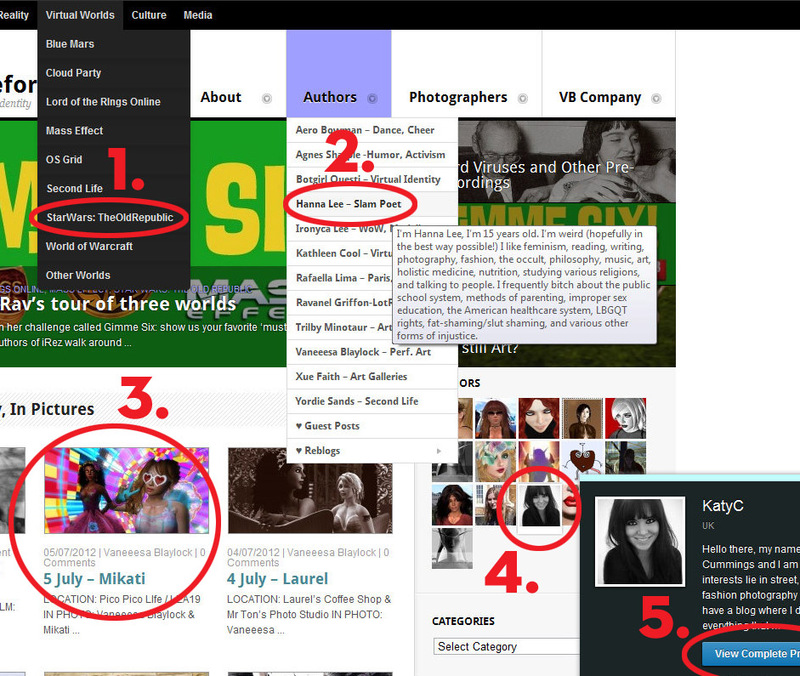 4 – In addition to the author drop down menu as shown in #2, in the sidebar is the author photo grid. If you hover over an icon as Katy is hovered over here, you can either click the author icon itself or the blue “View Complete Profile” button. 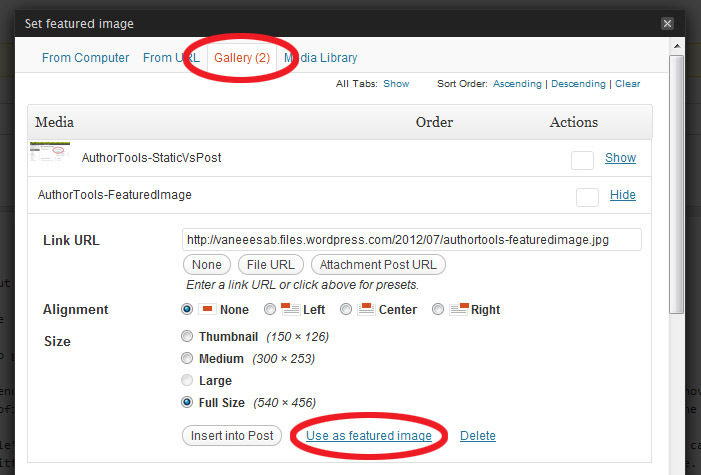 If you click the author icon, like #2, it will give you an archive listing of all the posts by that author. 5 – If you click the “View Complete Profile” it will take you to the author’s “Gravatar” page where you’ll see whatever they put there. You can put photos, a background if you like, and also links to other web places: blogs, wikis, Twitter, Facebook, Tumblr, Pinterest, wherever you’d like peeps interested in your stuff to find more. Also the image and words you put on your Gravatar will be the “About The Author” at the bottom of each post of yours on iRez. 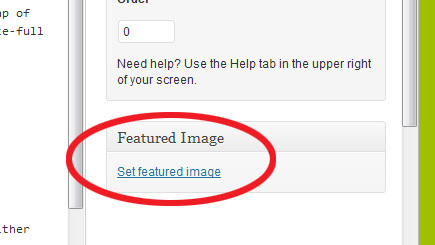 To “Set Featured Image” just click the SFL link in the lower-right corner of your post edit window. Once I get to your post page, I’ll see all the words, pix & vids you put there. But on the home page as well as any “archive” page like the Star Wars: The Old Republic Archive or the Hanna Lee Archive or the KatyC Archive, on all these pages I’ll see your “Featured Image” and a sentence or two preview of the post. Basically, if your post has 5 pix, just pick the one you want to be the “Featured Image” on the homepage or archive pages and set it. Or if you only have 1 image, then it’s a no-brainer. And our “Woo Themes Internal Framework” (“WTIF”) (hahaha) will dynamically crop & resize it to fit each of the various places it might be used. So our “WTIF” will worry about pixels and you won’t. Unless, like, you’re Vaneeesa. So unless, like some people, you have a pixel fetish, why even bother to make a special “Featured Image?” Why not just use an image you’re already using and let our WTIF do it’s job? Since all the different places we have featured images are horizontal, if your image is also horizontal, you really can just use the image itself, and WTIF will make it fit. If your image is vertical, well you can still leave it to WTIF, but it’ll slice a horizontal strip out of the center of your vertical. So, for example, in a waist-length vertical self-portrait, WTIF might make an FI of your breasts and not your face. If you want to make your own FI, either because your pix is vertical or because featured images aren’t that big and you want to crop in on some detail, you can use any image editor. With Photoshop or Gimp you can do exact pixels, or with a free editor like Picasa you can just do “something horizontal.” Really as long as you make “something horizontal,” WTIF can work out the exact pixel details for each location. If you happen to be one of those pixel fetishists, then cropping your Featured Images to 660 x 330 pixels is great. In a program like Picasa, you can just set the crop tool for a 2:1 aspect ratio. I love to make impactful images by cropping in tite to something interesting, but if it’s like a face, you might leave a bit of “headroom” so it still works in different places.